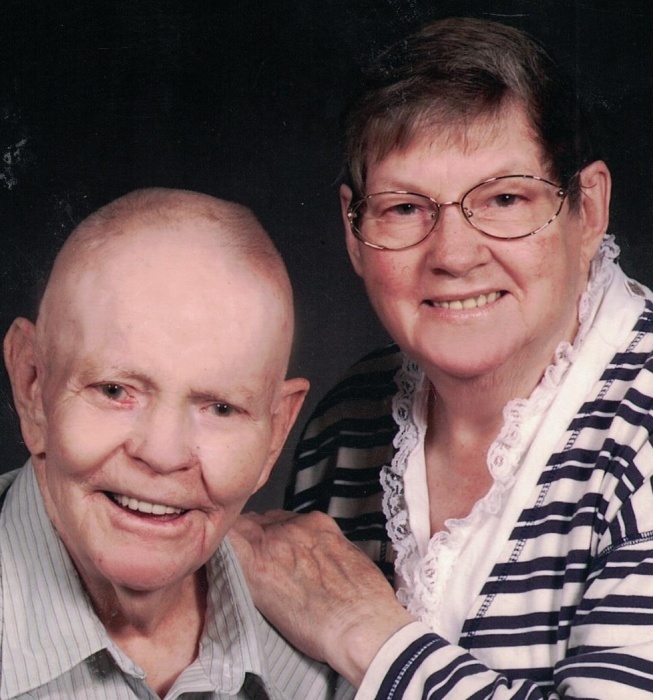 Combined celebration of life service for Faye and Gene Thomas will be held Tuesday, February 5, 2019 at 11:00 a.m. at Golden Oaks Chapel with Chaplain Gary Miller officiating. Services are under the kind guidance of the Amy Stittsworth Funeral Service. Faye was born on December 19, 1933 in Hennessey, Oklahoma, the daughter of Owen and Bonnie Griffith Roberts, and passed away peacefully on January 30, 2019 in Enid. Gene was born on November 10, 1933 in Enid, the son of Luther and Maddie Thomas, and passed away on December 12, 2010 in Miami, Oklahoma. Survivors include daughters, Linda (Loy) Marshall of Yukon, Oklahoma, Diane Johnson of Perry, Oklahoma, Peggy Thomas of Enid; sons, Bob Thomas of Hennessey, Oklahoma, Bo Thomas of Kaw City, Oklahoma; 15 grandchildren; 29 great-grandchildren; one great-great grandchild. Karen Dennis preceded Gene and Faye in passing.